The cost of international biometric passport in Ukraine in 2017. How long it takes and where to apply. In Ukraine people have local passport used as main ID inside the country and if they need to travel abroad they need to get International Passport. It can be with a chip with biometric data about the person or without a chip. The cost of the passport is $45 if you want to make it fast and it will be ready in 7 working days. You can also get it cheaper for $35, the passport will be ready in 20 days. International passports are issued by Migration Service of Ukraine that has offices in all cities around Ukraine. The international passport is valid for 10 years and you can get it starting from the age of 16. Children can also have international passport, but it is valid only for 4 years. See more details here. 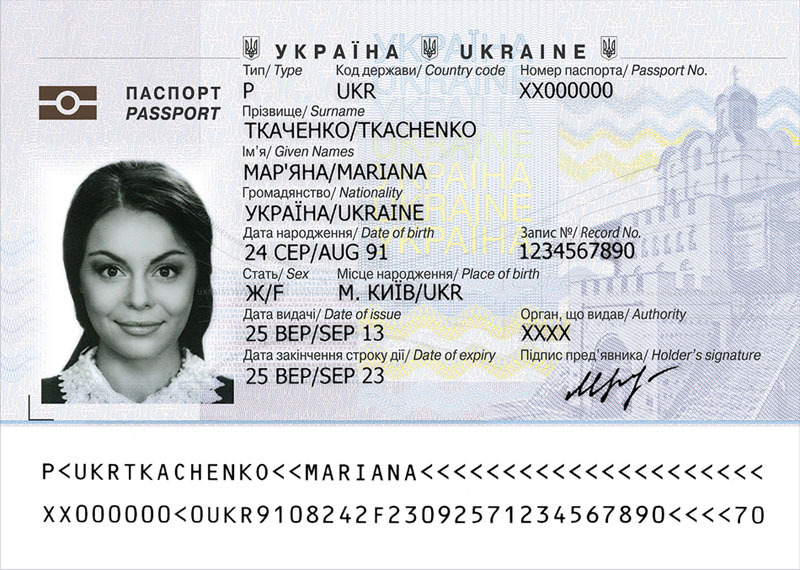 Sample image of Ukrainian biometric international passport in 2017. Very often scammers from Ukraine ask a lot of money to make international passport to be able to travel abroad and they also say it's difficult. Now you know that it really doesn't cost much and can be made very fast. Here is a good article with more details about where to apply, how long it takes and what documents needed to make biometric passport in Ukraine: The cost of biometric international passport in Ukraine.